The "Neue Burg" or "New Castle" was built in the later part of the 19th century and finished only in 1913. The architecture was partly inspired by the original designs of Fischer von Erlach, but spiced up to make them even more pompous. The architect responsible for this noble job were Gottfried Semper (who also co-designed the Burgtheater Theatre nearby) and Karl von Hasenauer. The original plan was to embrace the huge Heldenplatz Square and make it a giant courtyard, thereby almost doubling the size of the Hofburg. Fortunately, time and money ran out and so this plan was abandoned - adding to the lack of symmetry in the Hofburg. One good thing is that you can now stroll around in the Volksgarten, which occupies an area that previously consisted of bastions to secure the Hofburg. These bastions were demolished by French troops after the defeat of Austria in the Napoleonic wars, opening a lot of space now gratefully used by the Viennese and tourists. There is a Greek temple, the Theseus Temple, some formal gardens and a shockingly kitschy memorial for Empress Elisabeth alongside with a lot of greens. 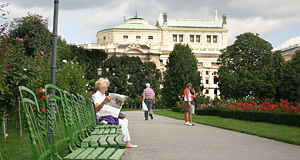 From the Volksgarten Park, you can also enjoy good views on the ling of representative Ringstraße buildings: The Kunsthistorisches Museum, the Naturhistorisches Museum, the Houses of Parliament, the Rathaus Town Hall, the University, the Burgtheater and finally the Bundeskanzleramt (Chacellor′s Office) in the Ballhaus. Best of Ringstraße, in a way, and you don′t even have to walk. There are two memorials on the Heldenplatz Square, the central square that the Neue Burg′s central palace faces: Prince Eugene of Savoy, who made Austria. Well, in a way he did: As the empire′s most successful general, he defeated the Turks sufficiently enough to allow Austria to develop the Baroque bloom that it is now famous for. The other guy is Archduke Karl, who was less important. Anyway, the Heldenpaltz Square is most famous for the Adolf-Show: From the balcony of the Neue Burg, Adolf Hitler welcomed ten thousands of cheering Viennese after the Anschluss had incorporated Austria into the Nazis′ Third Reich. For many Austrians, the Heldenplatz (meaning "Square of the Heroes") is therefore the site of the ultimate moral fall of the nation. One of Thomas Bernhard′s brilliant, but highly controversial plays is named "Heldenplatz" and deals with questions of moral responsibility and the very basis of the Austrian spirit. Behind the Neue Burg is another park, the Burggarten ("Castle Garden"), which similar to the Volksgarten occupies the site of a previous bastion. After this bastion had been demolished by the French to expose and humiliate the Austrian Emperor, the space was transformed into a garden in - do not ask me why - French style. Of all the styles in the World of horticulture, apparently the French one seemed most appropriate for this place. Today, the dirty side of the Hofburg faces the garden - the façade darkened by the decades of Viennese traffic and the dust of two World Wars, it is in urgent need for some renovations. Visitors of the Burggarten generally do not care, as they either come to admire the utterly disgusting and incredibly kitschy Mozart memorial (tourists) or to drink beer and smoke weed (locals). Another attraction is the Schmetterlingshaus (butterfly house) that was moved to this site from Schloss Schönbrunn recently. There is also a Palm House now including an up-market café.